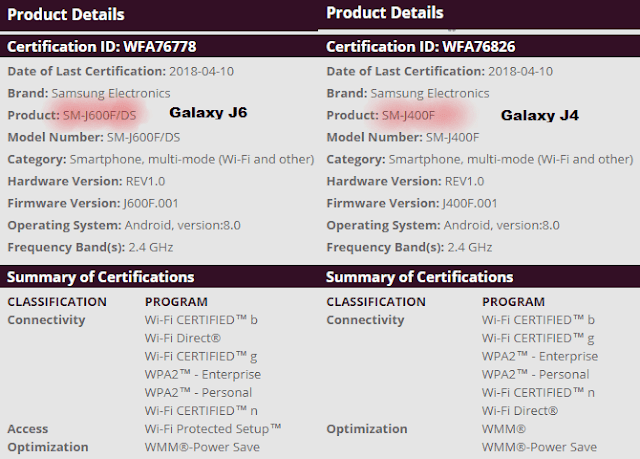 Today, the latest rumoured smartphones from Samsung has been listed on the Wi-Fi Alliance Certification website named the Galaxy J4 and Galaxy J6 with the model numbers SM-J400F and SM-J600F/DS respectively. The two Galaxy J series smartphones were already spotted on the Geekbench benchmarking website in February. 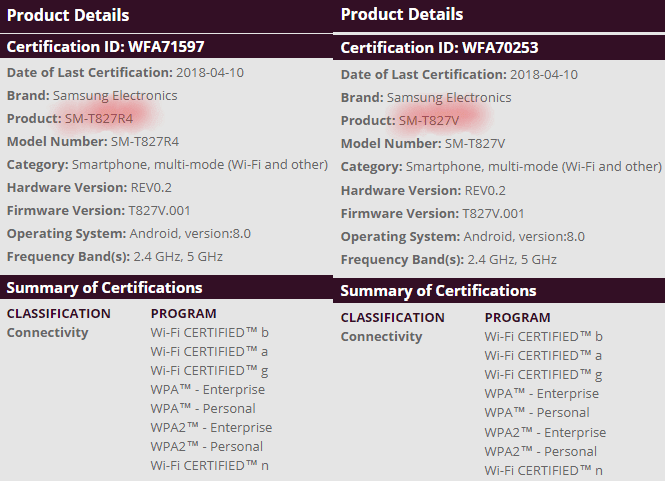 As per the listing on the Wi-Fi Certification, the upcoming J series smartphones run on Android 8.0 Oreo and both the devices run on the 2.4GHz network. The remaining specifications of the Samsung Galaxy J4 and Samsung Galaxy J6 hasn’t revealed by the Wi-Fi Alliance Certification. As per the previous Geekbench listing, the Samsung Galaxy J4 is powered by Exynos 7570 with 2GB of RAM. It has a 1.4 GHz quad-core processor with a screen resolution of 1200x1920 pixels. The Samsung Galaxy J6 packs a 1.6GHz Octa-core Cortex A-53 CPU with 2GB of RAM. It runs on Android 8.0 Oreo and is powered by the Exynos 7870 SoC. The Samsung Galaxy Tab S3 Verizon with model number SM-T827V and Samsung Galaxy Tab S3 US-Cellular with model number SM-T827R4 has also been listed on the Wi-Fi Alliance Certification website. As per the listing, the Samsung Galaxy Tab S3 SM-T827V and SM-T827R4 has a 2.4GHz, 5 GHz band frequency and runs on Android 8.0 Oreo. It seems to be that the Galaxy J4 and Galaxy J6 will be launched very soon and is expected to have lower pricing. For more details, we have to wait for the official launch by Samsung.